Do you worry you are wasting too much food? Use up leftover food with easy recipe ideas. Save money on your food bill. 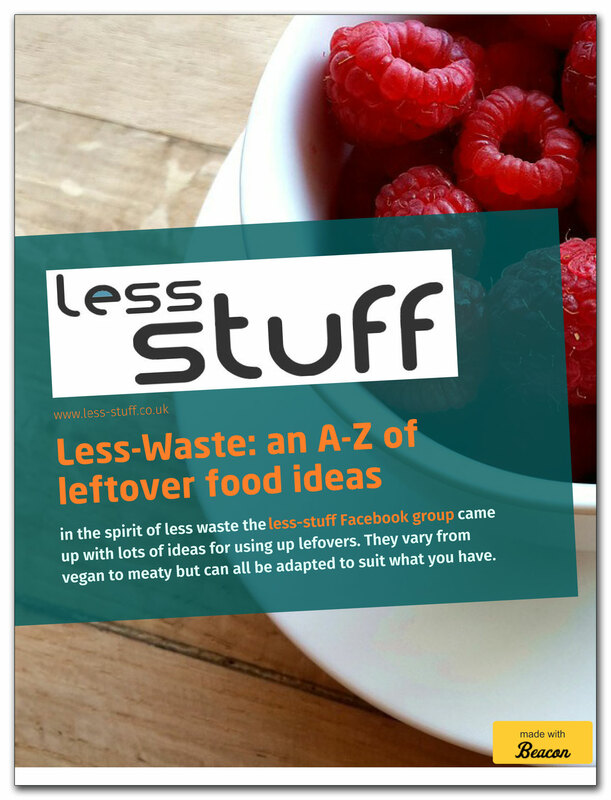 Help the environment by throwing away less food. Includes Avocado and Chocolate Mousse, Cauliflower no Cheese, Potato Bread and a whole load of recipes suitable for all diets. A voucher for a free book from the less-stuff shop. Occasional reminders and tips with ways to declutter gently without getting stressed out about it. Mailing lists are vital for little enterprises like less-stuff. I don’t have a marketing budget, or money to spend on advertising so if I find someone who likes what I do, it really helps to be able to tell them about new things that are happening on the site. I will never sell your details and I do not email often.